Do you believe that hard work pays off? Do you want to accelerate your career? Our Full-Time MBA program is for you. In this 10-month program you'll be surrounded by a small cohort of like-minded students who are equally driven to succeed. Completing your MBA in less than a year also is a great return on your investment of both time and money. Why get your MBA full-time? You’re eager to advance your career and you have your sights set on an MBA. It’s a great investment and will help you develop the highly sought-after skills and knowledge needed to stand out in the workforce or jump-start a new career. If you believe hard work pays off and you want to accelerate your career, then our full-time MBA program is for you. In this 10-month program you will be surrounded by a small cohort of like-minded individuals who are equally driven to excel. You will complete your MBA in 10 months, a great return on your investment of both time and money. 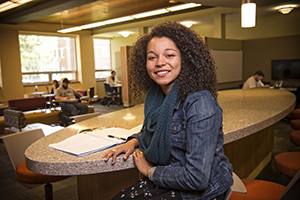 Why choose UNH’s full-time MBA program? Where you get your MBA matters. 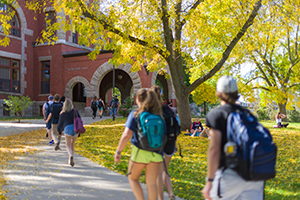 Paul College’s program is accredited by the Association to Advance Collegiate Schools of Business (AACSB), the gold standard for business schools. Our faculty stand out as active researchers and former executives who bring real-world perspectives to their teaching. You will be part of a small-cohort based learning experience, where your classmates, who come from diverse fields, will challenge you to think beyond your base of experience. Included in program tuition is a three-day New York residency and a 10-day international residency. Cap it off with a corporate consulting project, where you’ll apply what you’ve learned to help solve a real-world business problem. In addition to the small cohort, and the New York and China residencies, two things stuck out in the Full-Time MBA program for Dante Lamb '18G: the faculty in the program and the Corporate Consulting Project. “The commitment that the professors show is amazing." Earn your Master's in Business Administration from Paul College of Business and Economics at the University of New Hampshire, the state's flagship university. What sets us apart is our distinct combination of rigor, relevance and a world-class faculty. Our students come from various industries - from more traditional business fields like finance and marketing, to engineering, law, healthcare and the military. Some are seeking growth within their current organizations while others are looking to gain the skills and knowledge to change professions. The Full-Time program format is designed for students interested in devoting one full academic year to complete their MBA. The new and innovative curriculum is designed to accelerate a student's progress through this highly-­ranked AACSB­ accredited M.B.A. program in 10 months. The program does so by integrating courses, identifying key skills and concepts necessary for success in business, and then helping students master these skills and concepts through class discussions, cases, guest lectures, and applied projects. Throughout the program, students are exposed to knowledge that builds insight into complex organizations. The Full-Time MBA program includes a New York City residency, an international residency, and a corporate consulting project. Students have the option to finish their coursework in late May or in July, dependent upon whether they elect to take courses in Term 5, and have May or September graduation dates respectively. M.B.A. courses are intended for matriculated students who have been admitted to the M.B.A. program. Other degree­ seeking students and M.B.A. alumni may request permission to register for courses on a space­-available basis. Audit: Required M.B.A. core courses cannot accommodate auditors. Other degree-­seeking students and M.B.A. alumni may request permission from the instructor to audit M.B.A. electives. The curriculum for the one-­year intensive Full-­Time M.B.A. program begins in August when students start classes on the Durham campus following an orientation program. Students continue together as a cohort through the academic year. The 48-­credit program is comprised of ten required courses, five electives (or four electives and one internship), a three-day financial residency in NYC, a ten­-day international residency, and culminates with an eight-­week, 3-­credit corporate consulting project. Electives can be taken in such areas as marketing, finance, global business, growth and innovation, information systems and business analytics, and hospitality management which each feature optional three- or four-course specializations. Students with less than two years of professional work experience are required to complete a 140 hour internship that satisfies one elective course. Students with more than two years of professional work experience are also encouraged to engage in an internship in order to explore new fields or functions. Core courses focus on developing leadership and managerial skills through informed through informed decision making grounded in rigorous analysis. Students will learn the behavioral and social skills that empower effective leaders in any organization as well as the technical skills necessary to understand complex business processes, manage the development of technology projects, and utilize data for effective decision-­making. Core courses and electives build an understanding of the business environment. The corporate consulting project (CCP) provides an immediate opportunity to apply this knowledge to the real world of business. The cohort is divided into small teams which are each assigned to a local organization. Each team works closely with the client organization and faculty advisers to solve a real-­life problem for their company. At the end of the CCP, each team presents their results to their organizational sponsors and classmates. The Full-Time M.B.A. curriculum is complete at the end of Term 4 with a total of 48 credits. Students have the option of taking courses in Term 5 to complete a specialization or for their own interest. These courses are offered at the continuing education cost. A specialization is not required. Specialization courses are open to all Paul College M.B.A. students as electives. Some specialization courses are available only online or in one physical location. Not all specializations can be completed in one academic year. In order to complete a specialization, students may need to take courses in Term 5 (Summer). FINANCE: this specialization provides students with the tools necessary to make informed financial decisions for themselves and their organizations. Finance students and professionals utilize an exciting mix of quantitative analysis, strategic thinking, and creativity. Opportunities exist in a variety of fields, including commercial and investment banking, corporate finance, asset management, risk management, real estate, and private equity. INFORMATION SYSTEMS & BUSINESS ANALYTICS: This specialization provides students with knowledge and skills in the areas of business analytics: descriptive, predictive, and prescriptive. These tangible abilities will enable graduates to bring added value to any organization through data analysis and visualization; predicting/forecasting future probabilities and trends; and helping decision makers evaluate and determine the best ways to achieve business objectives in resource-constrained environments, while also quantifying the risk present in business situations due to uncertainty. MARKETING: this specialization is designed around the three strategic initiatives of the marketing department: Marketing Analytics, Digital Marketing, and New Product Development. Flexibility within specialization provides tracks for less seasoned students (Marketing Analytics and tools), and for more seasoned students (Product and Service innovation focus). Designed to help students recognize, prioritize, and execute opportunities for growth through new and existing customers. GLOBAL BUSINESS: this specialization helps students develop their global awareness, understanding, and competence so to that they can compete and lead effectively in a transnational environment. Job outlook includes graduate careers abroad or in organizations that are engaged in business or initiatives with a global scope. GROWTH & INNOVATION: this specialization provides students with knowledge, skills, and an entrepreneurial mindset to apply in smaller, newer firms as well as in larger, established companies in order to drive organizational growth, innovation and change. These can be applied in a range of contexts, including new ventures, corporate entrepreneurship, and social enterprises. HOSPITALITY MANAGEMENT (available to Part-Time and Online students only): this specialization is directed toward working professionals, positioning them for additional career growth and advancement in the industry. For students who wants to take a coherent set of advanced hospitality management courses offered within the general framework of the MBA, these course offerings provide opportunities in a wide variety of areas, including human resources, operations, and asset management and finance. GMAT test scores are normally required. Applicants may petition to waive the GMAT if they hold a previous Master’s degree or if they have more than 5 years of experience including supervisory, managerial or strategic responsibilities or a strong GRE. If required, request official test scores to be sent directly to the Graduate School by the testing service. Test scores more than five years old are not acceptable. Student copies and photo copies of scores are not considered official. Our CEEB code is 3918. Applicants to the MBA Program must provide answers to these specific questions: 1) What are your short and long term goals? Why is an MBA a critical step toward achieving these goals? 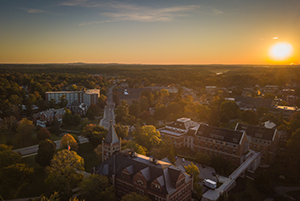 Why are you interested in UNH? 2) List 10 facts about yourself that will help your future classmates get to know you. *Optional: Please provide any additional information you believe is important and/or address any areas of concern that will be beneficial to the Admissions Committee in considering your application (e.g. unexplained gaps in employment, choice of recommenders, academic performance, or extenuating personal circumstances). A current resume is required with your submitted application. Two or more years of experience recommended. An interview may be required at the admission committee's discretion. If you are planning to take the Hospitality Management specialization, or some other specialization, please indicate this when you fill out the online application. You can enter this information under the planned major section of the application.